Today I will focus on grains. These markets are now strongly oversold. A spread trader focuses on bull spreads in such situations. However, not all market types are suitable for bull spreads. Today we will look at this problematics in details. I’m starting with this market because the bull spreads on soybean are the most interesting of all grains. 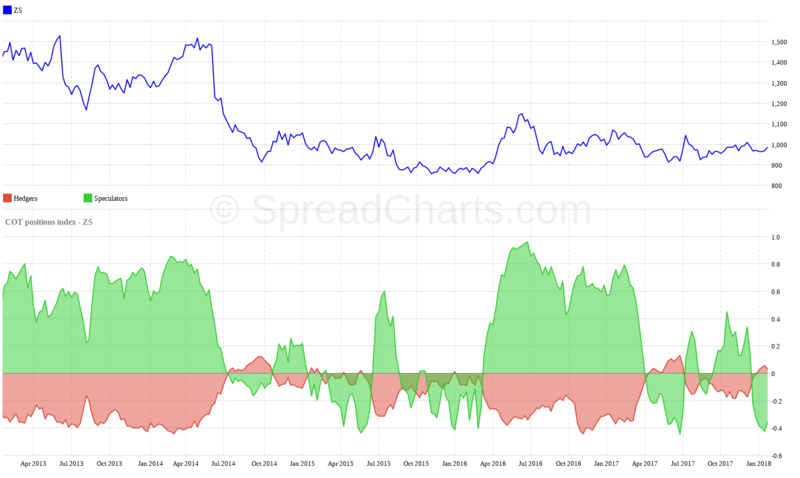 There is, of course, the soybean meal, but it is so correlated with soybean, that it’s basically the same idea. 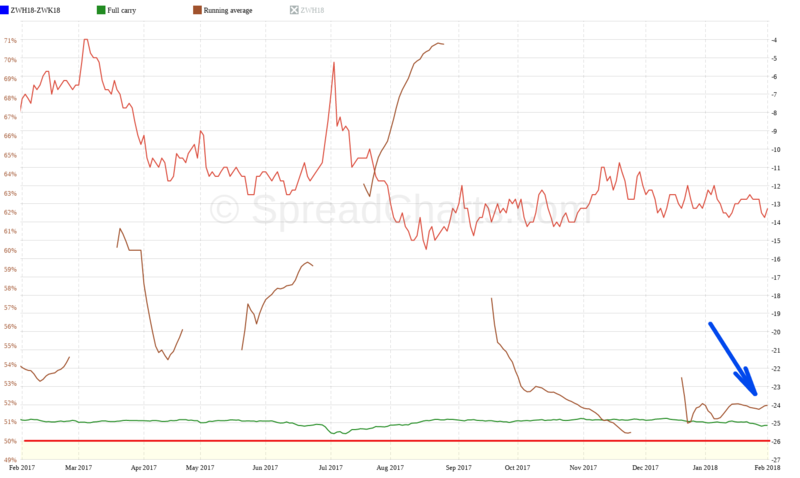 The most popular is bull spread between two harvests, July – November (for this year it is ZSN18-ZSX18). In the following chart you can see its development over the last 10 years. 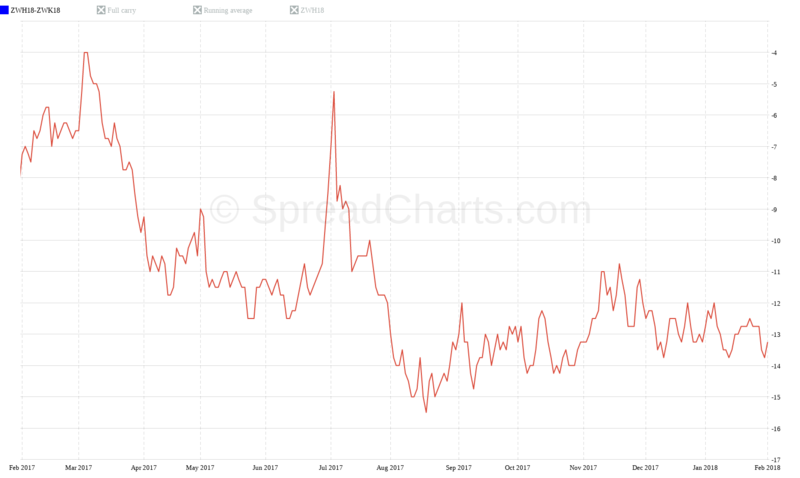 It is obvious that spread can be very interesting in some years. The risk to reward ratio involved in the resulting profit can be very interesting here. But as you can see, it’s not like this every year. The bigger half of the curves are found at the bottom of the graph. 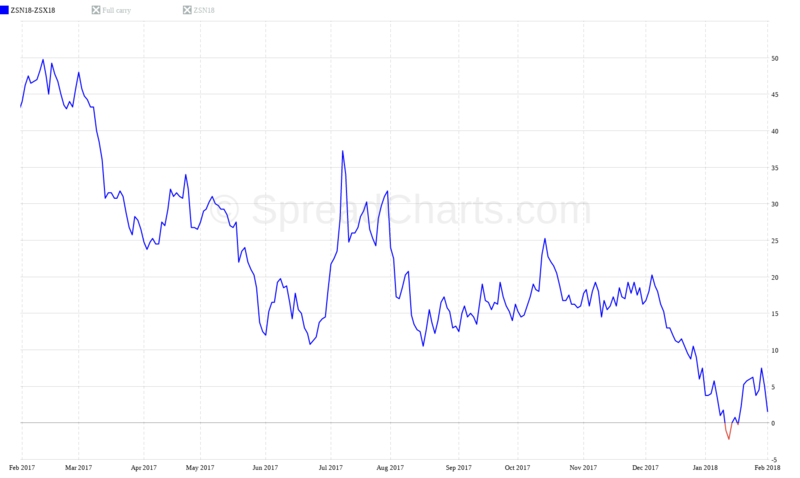 Spread does not need to grow further or does not grow at all. But this is a typical feature of bull spreads in general. Very favourable RRR ratio, on the other hand low success rate. And how do I see it this year? 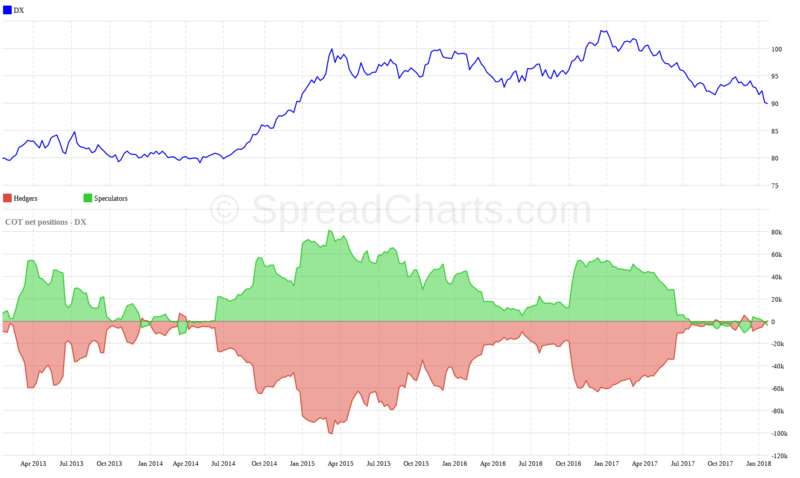 I wrote my indebt insights into the latest Spread report. I am personally waiting for correction. I think the spread could still grow, that is to consolidate for some time around the zero level first. Yes, it is true that the market is extremely tight. But the price of soybean is so far refusing to break through a strong barrier of 1000 cent. If I see a clear breakout on the chart, it will be another supportive signal for me. Of course, it will also depend on the development of the further analyzes. Breaking up of soybeans can also be supported by two fundaments. On the one hand, it is the threatening drought in South America, where they slowly begin with the harvest. Long drought could worsen existing expectations. The second reason is a relatively strong US export, which could also boost soybean. Wheat is also very interesting. For us, spread traders, it is rather a short-term opportunity. Specifically, it is the bull spread ZWH18-ZWK18, which I am holding also by myself. Here too, the market is clearly oversold from the COT analysis point of view. But this does not have to mean an immediate growth of the commodity price. This imbalance may be fairly balanced by a smaller growth correction or longer-term consolidation. In that case, however, the bull spread would go sideways or slightly fall. So far it seems, that the growth on wheat price might not be without hope. The nearest March contract clearly broke up. 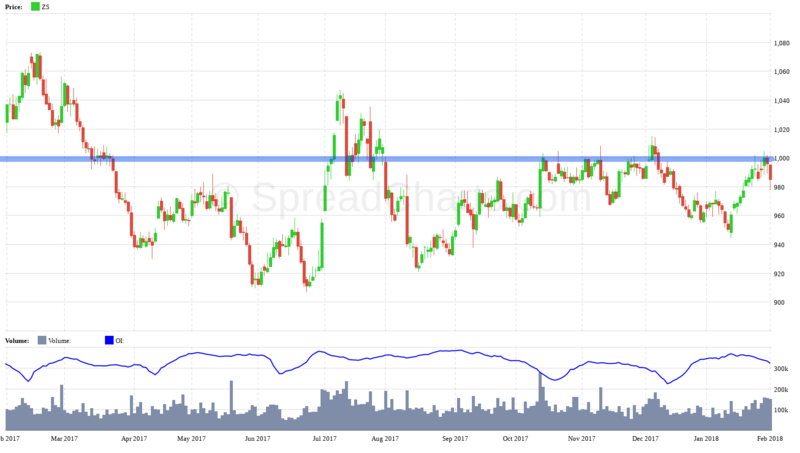 The spread is currently testing a strong resistance at 460 cents. If the price can overcome this barrier, I see a very good chance here to reach further levels above 500 cents. I see this opportunity just as a very short-one. Soon, the March contract expires soon, so not much time is left. 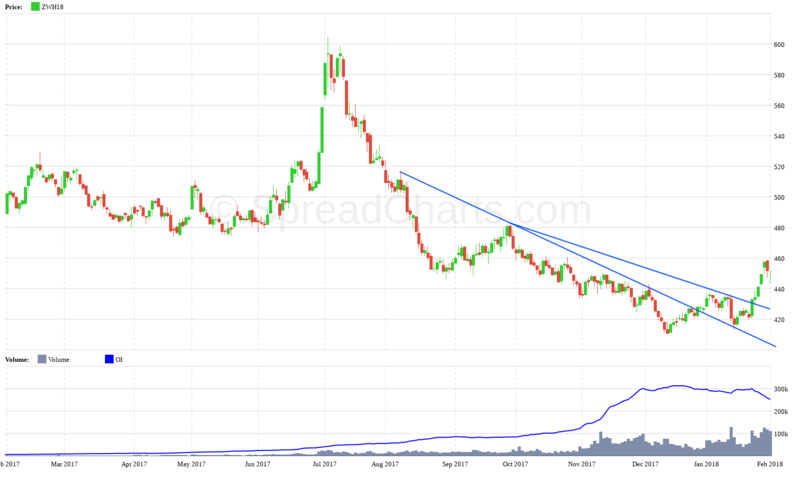 But as I have mentioned in the Spread report, there is one more thing that could be good for bull spreads from a longer perspective as well as for the wheat market itself. This is the decrease of the maximum storage rate (costs associated with the physical possession of the commodity). The market has tried it several times, but it has never worked. 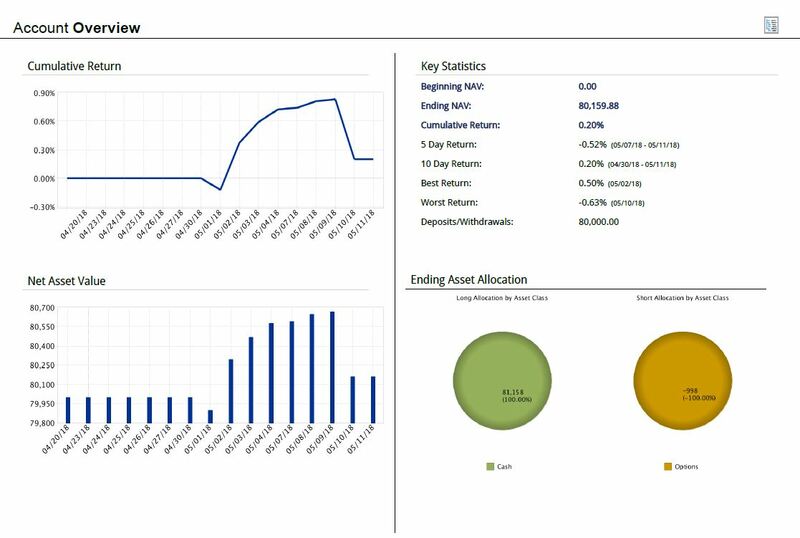 As a great tool to help us predict the change of storage rate and thus full carry, there is a running average analysis. Here you can see the following chart. I will explain it very briefly; the full carry will drop when the current brown curve ends in the lower yellow part (ie below 50%). This would most likely push the bear spreads downwards and the bull spreads upward. As a supportive factor for wheat growth, there is also an abnormal drought in the US, which worsens the overall conditions for good harvest. So far, only a relatively small percentage of wheat shows good development. In a recent article, I was mentioning that the dollar movements are affecting other commodities. At the moment it is not excluded that the dollar will go up in the short run. It is implied by price movements as well as by the analysis of the sentiment. So, if the dollar really goes up, it will have a negative impact on the grain. Even though the dollar does not affect the grain commodities to such extent as metals or energies, it would not be a favourable sign. 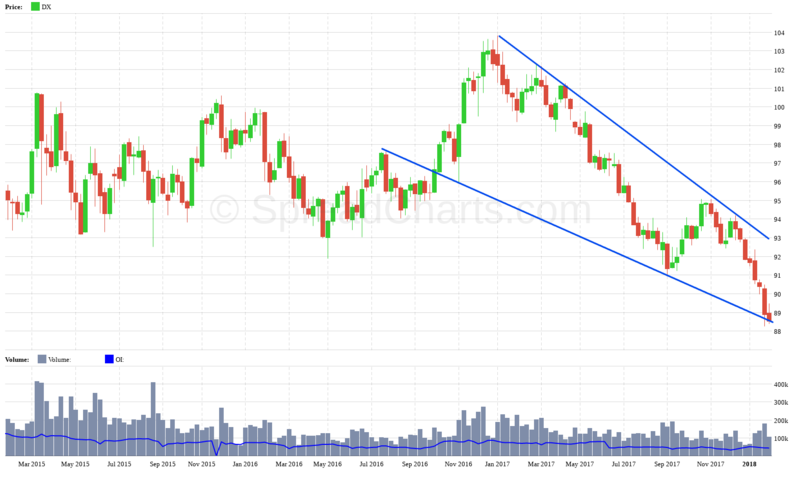 In any case, the dollar would probably undergo just a short growth correction that would probably slow down the growth of the grain. 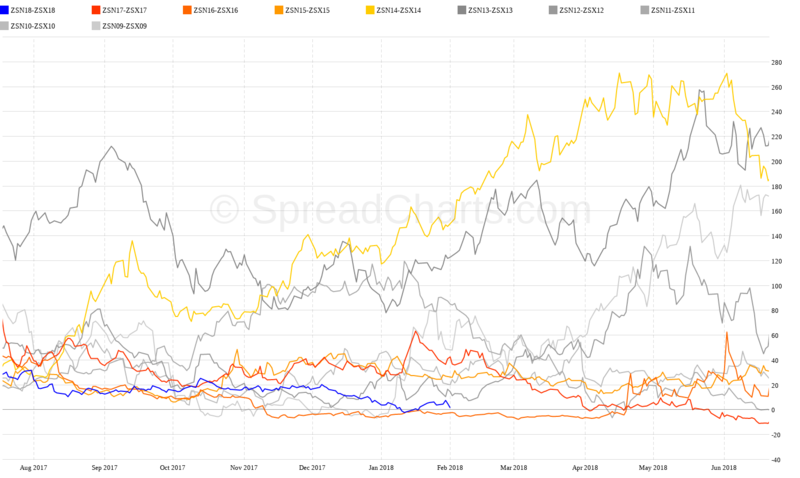 So, soybean, soybean meal and wheat are currently the most interesting markets for spread traders in the grain group. 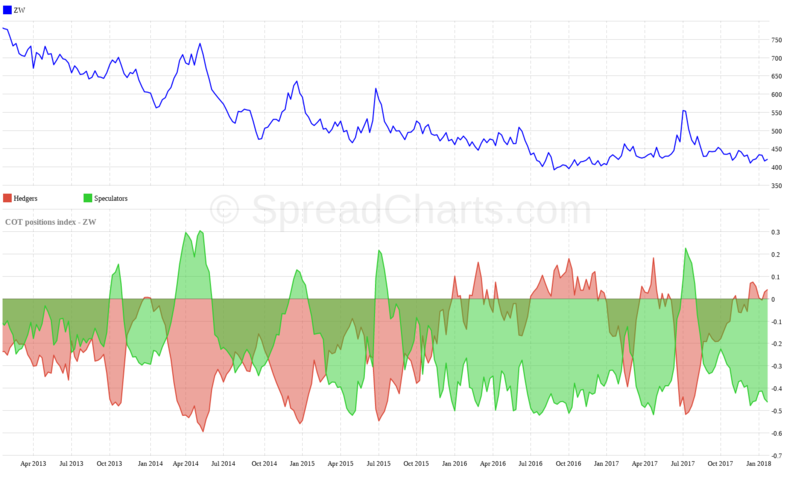 Corn is also obviously oversold, but bull spreads are not that exciting, so I’m hoping for bear spreads on this market.